Next→Looking At The Guitar While Playing: Is It Bad? Evernote, the popular note-taking app, can give a big boost to productivity. You can download Evernote on all of your computers and other devices, and keep them synchronized easily. You can make lists of songs you want to learn, save information that you want to keep for easy reference, and track your progress. This makes tracking, monitoring, and note-taking a breeze, and it can help make you a more productive practicer. You will likely find that your practice is best organized via several different docuements: a practice log recording your daily practice, a practice queue documenting all of the things you’d like to practice, and a repertoire list, tracking all of the tunes you know how to play. You may also want to write out your practice goals at a given interval (annual, monthly, etc) to help steer yourself in the right direction. A practice log should be simple, because you don’t want to waste your practice time writing in a diary. Your practice log should be something you can access and update instantaneously. Evernote is great because all notes are synced via the cloud. This makes your notes accessible, which is good because you might need to make an entry to it from multiple locations. Evernote doesn’t support spreadsheets, but Google Docs and others do. A spreadsheet would allow you to log your daily practice time—and calculate out a total over time. When organizing your practice, don’t worry about keeping the information too tidy. Type fast, and don’t correct typos. You don’t have time to waste on editing and formatting. A practice queue can serve you for years by helping you to keep track of all of the things you’d like to practice. The problem with the practice queue is that each of the materials on it will advance progressively through different stages of mastery. Practicing an item once and checking it off is not enough to master it. To get around this, create a check box next to each item, and check them off as you practice them over the course of days, weeks and months. If you practice an item that already had a check, create a new checkbox—and check that off too. If you manage to finish practicing everything in your queue (and good luck with that! ), you can look it over top to bottom and assign new, blank check boxes to any item that you feel still needs work. When something starts to get so developed that you no longer need to practice it, change the color of the text to gray. Don’t worry about maintaining a perfect list. This is just for your own information. 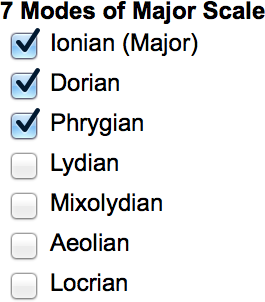 Do you have a list of repertoire that you can play? One of the best uses for Evernote is to keep track of your tunes. 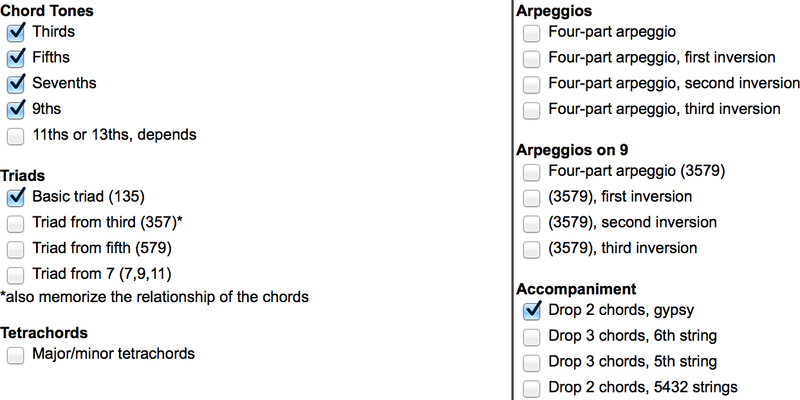 Using the Carousel Method of Memorization you can keep a list of all of the tunes you’re working on memorizing. Here’s an example. Now, when you begin a practice session using this list, you will recite at least one of your memorized tunes and work on another of your not-yet-memorized tunes. 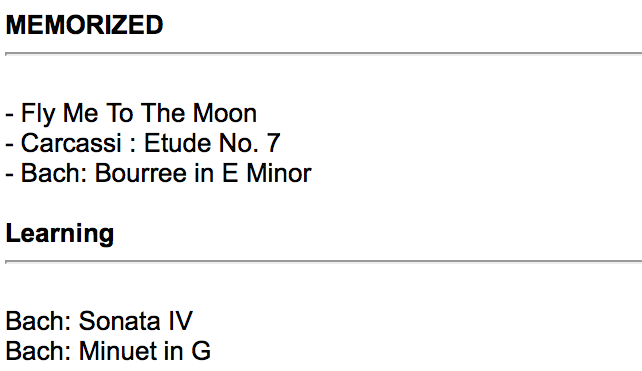 Because “Fly Me To The Moon” is on the top of the list, that is the first tune that you will run through. But then you should move it to the bottom of the list, so you won’t run through it again until you’ve given your other tunes a chance. As for your “Currently Learning” list, that might work a bit differently. You have limited time to learn new tunes, and you don’t increase the value of time by smearing it over lots of tunes. It might be best to focus mostly on the top tune on the “learning” list until it’s memorized and ready to be added to the “memorized” list. But, the easiest and shortest tune is also probably the best one for the top of the list. If you begin using a system like this, make clear rules and don’t pollute them. If you start adding tunes you haven’t really memorized to the top list, it defeats the purpose and weakens your confidence in your own system. A list of scales that were practiced; no item on the list will be repeated until they’ve all been practiced once. Another weakness many practicers have is that they don’t manage to spread their time evenly. Many of the materials we undertake to practice end up turning into a very large list. For instance, if you want to memorize all modes of the major scale, you’ll probably end up practicing some of them more often than others. But this isn’t just about memorizing patterns. 10 years down the road, we may have it on our practice list to run all of those mode patterns through some amazing sequence we’ve discovered and the same problem ends up happening. We start our practice session with good intentions, but after doing the first three modes we get distracted and switch to something else. Keeping a list helps you avoid this. This also works for longer and more detailed lists of advanced exercises. For instance, here’s a jazz player’s list of “stuff I want to be able to play over the chord changes to Autumn Leaves”. A list of things to practice playing over the chord changes. This ensures the changes are learned very thoroughly and the improviser can play them in a huge variety of ways. The more advanced you become, the longer your practice queue gets—and the more useful this gets. As you approach more and more advanced levels of guitar playing, the number of neglected areas in your practice will grow, and never shrink. Thats because for every one concept you master, you’ll discover several more. If you want to make the most of your guitar practice time, you’ve got to practice. But you also want to practice smart, spending as much time as impossible working on areas that need improvement. Keeping organized is one of the best ways to make sure you’re practicing smart, and spending that limited practice time productively. Next articles lesson: Looking At The Guitar While Playing: Is It Bad?